Musicianship is a gift that keeps on giving throughout one's life. Engaging a child in musical education as early as possible has been proven to improve the early child development of their brain, as well as to connect the right and left side of the brain through neural networking. The benefits of music for a child are patently obvious; however, getting your little one hooked on playing music isn't as easy as just handing them a six-string and saying “go.” Before they can shred, they have to learn how to enjoy the process of playing a musical instrument and, for the guitar, parents can enable the conditioning of musicianship without their kids even knowing it. For kids of a very young age, say between a few months and 3 or 4 years old, the Zoo Jamz Guitar by VTech is the perfect place to start. Children can discover the joy of making music through the intuitively simple interface of this educational toy. Click on the image to check it out on Amazon. Simply pop in some batteries and they can start making music while, at the same time, learning and singing along to some of their favorite kid-friendly songs. 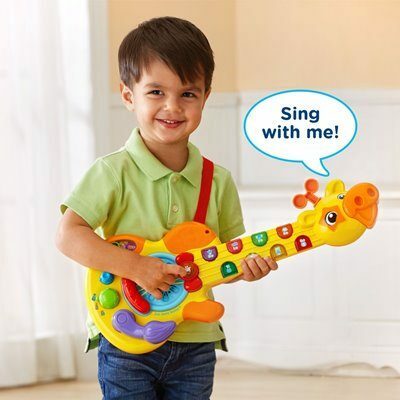 Kids will instantly fall in love with the bright colors, exciting interactions, and friendly giraffe-shaped guitar body of this guitar toy. Though it is classed as a child toy, it looks and works in the same way as a musical instrument and ideal for child development. 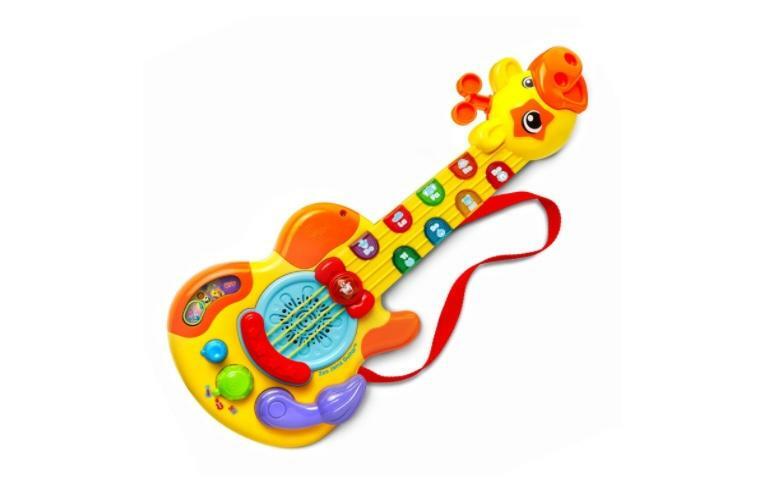 ​Once your little one has outgrown their happy giraffe guitar, they might want something a little more “real.” The Multi-Function Kids Electric Guitar Toy, by aPerfectLife, offers a serious step up in terms of play function and sound and even boasts a very cool design. 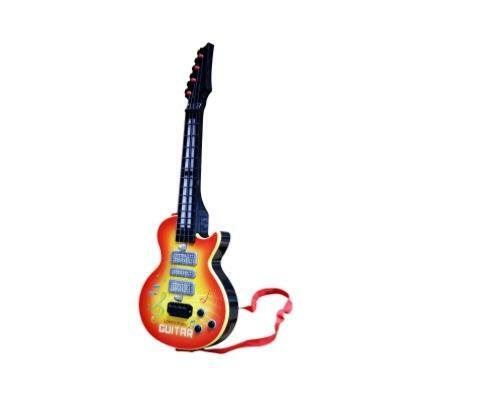 Designed for kids of the age of 3 and up, the Kids Electric Guitar is an educational toy and offers musical value by starting the whole process of teaching kids the basics of strumming, fret placement, and finger positioning. Plug it in and hear the strings squeal through a set of speakers for that performance experience. This kid’s guitar toy offers a great way for them to gear up for the real thing while successfully making some sweet, sweet music. 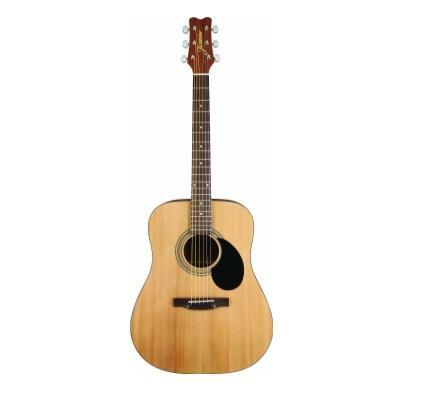 Once kids feel confident and comfortable playing a guitar toy with real strings, the Happy Tune 6-String Acoustic Guitar is the perfect next step. Watch as your little one transforms into an actual musician with a real guitar. The Happy Tune is built specifically for kids, but it is the real thing. The real steel guitar strings and vibrant resonant body gives a wonderfully practical learning curve to master, before moving onto the next level of guitars. With this, kids can learn technique regarding chord structure, finger pressure, picking patterns, harmonics, scale soloing, and much, much more. The Happy Tune 6-String puts the music directly into their hands. 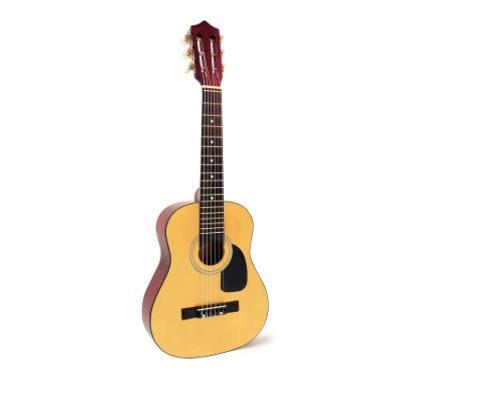 When they are ready for the real thing, the Hohner ½ Sized Classical Guitar is the ideal next step for the cultivation of a child's musicianship. 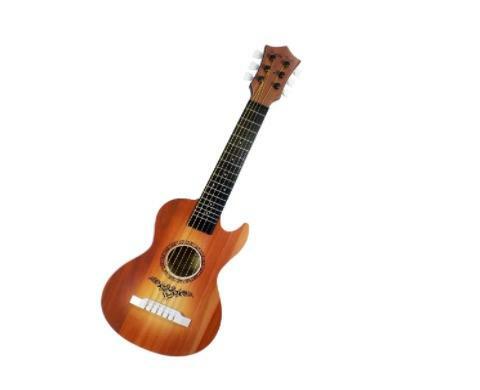 There is nothing about this half-sized guitar that is a toy; just a small classical guitar. The greatest benefit of the Hohner ½ Sized Classical Guitar is the ease of play and warm, rich sound – due to the fact that it inherently features nylon strings instead of steel strings. However, please take note: It Is Not Advisable To Introduce An Aspiring Guitarist To A Nylon String Guitar First Before They Have Learned To Play With A Steel String Acoustic Guitar. This is because nylon strings are easier on the fingers than steel strings, which require slightly much more pressure from the musician's finger tips to produce a clean sound. Developing calluses on the musician's finger tips is a crucial step in the ability to play and practice for extended durations, as well as to simply enjoy playing without hurting their fingers. This can only be accomplished by playing on an acoustic steel string guitar. In addition, the neck of a classical guitar is slightly wider than that of a 6-string acoustic, which makes a classical design more forgiving – allowing a larger margin of error for the fretting fingers. Again, this might seem like a benefit; however, in the long run, (for the beginning guitarist) it will become a hindering crutch to overcome or even a complete deterrent in continuing their guitar training altogether. Once a young guitarist has developed calluses on the tips of their fingers and learned basic acoustic guitar techniques on a steel string, the Hohner ½ Sized Classical will invigorate their musical passion and expand their abilities to a whole new range of playing genres. The smooth, soft nylon classical strings and wide, forgiving neck will enable them to play well on any guitar without any discomfort. For kids who are ready for the real, full-sized set, you can't get much better than a Jasmine Acoustic for a first real guitar. This is a beautiful instrument that will last your child a lifetime. Jasmine Guitars are known for their incredibly reliable and high-quality function, as well as their longevity of their playing lifespan. The neck is built slim for newer players, allowing their hands to easily reach the frets. With a spruce top, satin finish, chrome tuners, and a rosewood finish, Jasmine Acoustic Guitars don't just sound legitimate – they are. In terms of playability, quality craftsmanship, and value you simply can't go wrong. No matter the age, the skill level, or the musical intuition, guitar toys are fun and educational. Give your child the gift of inspiration, by starting them on a path that leads to musical creation. But Beware: If you give a kid a fun guitar toy, they’re going to want to play the guitar! Thanks for reading! Feel free to leave comments or questions in the space provided and be sure to sign up for our weekly newsletter for new and fun music stuff!